Established in the year 2010 at Rajkot (Gujarat, India), we “Sajj Decor” is a Partnership firm engaged in trading an excellent quality range of Floor Carpet, Wooden Flooring, Wall Cladding, Artificial Grass, EPDM Flooring, Jute Bag etc. Under the guidance of “Mr. Ajit Solanki” (Partner), who holds profound knowledge and experience in this domain, we have been able to aptly satisfy our clients. We are highly appreciated by clients for offering excellent quality products. With our team’s support, we have been able to cater to the varied needs of patrons in an efficient manner. To provide an end user high innovative quality products under the roof of Sajj Decor by opening the outlets all over the India that produce measurable value to them at the fair price. To provide Indian crafts to the prospective clients in the work by creating a convenient market at which products are easily available to the end users. 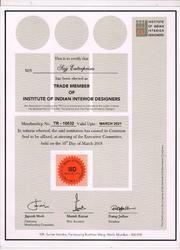 Our vision is to be top of the industries rank list in the Home Decor products by 2020.